Globe is bringing back its heavily-lauded Free Facebook promo this month. And alongside the return of the popular service, the Telco is also tagging along free VIBER usage for its subscribers. This is in lieu with the company’s goal to encourage the mobile data adoption across the country. The service will start in January 13 with Globe prepaid, TM, postpaid, and Tattoo customers. Subscribers can enjoy the telco’s world-renowned free Facebook offer alongside free Viber with no purchase or daily registration required and without need for Wi-Fi. “At Globe, we like surprising customers by giving something special from time to time. We like being the brand that introduces you to new experiences, especially at little or no cost. Thanks to you, our customers, our passion for digital experiences and your digital life makes Globe the fastest growing telco in the Philippines today. And increasingly, our approach is being adopted by others in the Philippines and across the world. We are humbled by all the local and global companies who have decided to follow in our footsteps,” says Peter Bithos, Chief Operating Advisor at Globe. “In that spirit, we don't want to let 2015 to start without a bang. 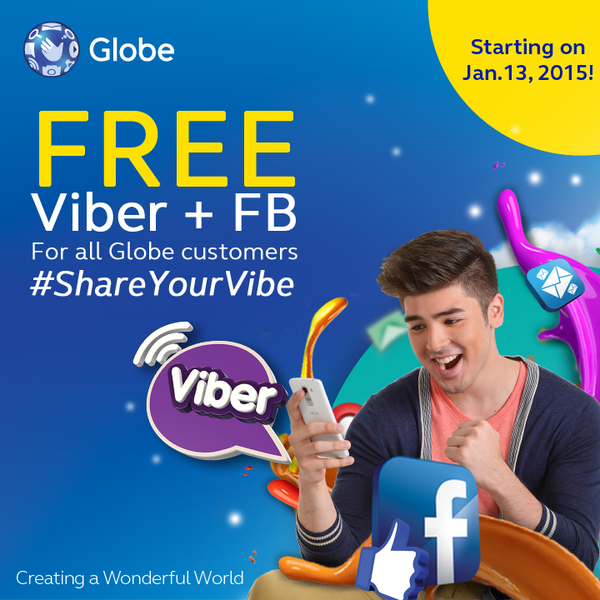 For an entire month beginning January 13, 2015, all Globe customers can share and chat for free with our free Facebook with free Viber offer And always with Globe, we make it easy for you: no purchase required, no promo required, no daily registration required, and available to all Globe mobile and Tattoo customers,” Bithos shares. Globe customers only need to register once by texting FREEFB to 8888 for free. Free Facebook on feature phones and smartphones can be accessed via the Facebook app or Facebook's mobile site, m.facebook.com. Moreover, there is no need for customers to purchase any data plan to avail of the promo, and will only be required to register once to enjoy Free Facebook all they want. Those who subscribed to Free Facebook previously and did not opt-out do not need to register to the offer. Meanwhile, free Viber can be accessed by simply downloading the app on their smartphones to be able to chat away for free. Globe forged exclusive partnerships with Facebook and Viber in 2013 to offer its customers free access to the world's leading social networking site and messaging app enabled by service innovations for a seamless browsing experience. Since then, Globe has seen double-digit growth in its mobile data users on the back of the increasing penetration of smartphones, rise in mobile internet adoption, and usage of applications and over-the-top (OTT) services for a richer mobile experience. Aside from this innovative offer that strengthens the telco’s commitment to serving customers’ digital lifestyles, Globe is also offering GoChat10 starting January 13. With GoChat10, Globe prepaid customers get unlimited texts to Globe/TM plus unlimited access to popular apps such as Facebook Messenger, Viber, Line, WeChat and WhatsApp all for P10 good for 1 day. Customers just need to text GoChat10 to 8888 for free to register to the promo.